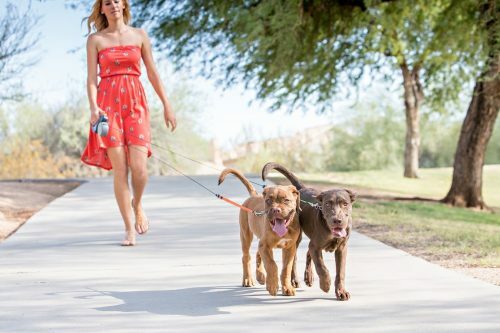 This non-tangling retractable leash allows you to walk two dogs at the same time, while maintaining individual control of each one! Dual Doggie spinning action works to prevent entanglement, for a safer and more enjoyable walk. Both the leash leads and brake buttons are color-coded, so you’ll always know exactly which dog you’re controlling. Stop just one dog, or stop them both. The struggle to hold two leashes and keep them untangled is over. One leash, dual brakes, zero tangle! It’s the smartest way to walk two dogs.